Web design is not the same it used to be several years ago. It keeps developing with every passing year, unveiling lots of opportunities to people across the globe. Websites become more functional and visually appealing, which makes it possible for their owners to reach their special business and personal goals. As the need for quality websites keeps growing, more people start thinking of creating their own services. For those of them, who have specific skills and knowledge, this doesn’t seem to be a problem at first sight. This is not altogether true, however. The thing is that they have already got used to using complicated programs that imply the awareness of web coding skills and expertise, which often takes much time. Newbies, in their turn, face an opposite problem. They don’t have any experience in web building at all and have much more questions on how to make the process quick, affordable and effective. Whatever group of web designers you belong to, there is a single solution that might be helpful to you. The use of website builders can notably simplify the task, offering plenty of advantages that contribute to the efficacy of the web building process. Let’s have a look at the top 5 services used to create websites nowadays. Purpose: SITE123 is a universal cloud website builder that serves several goals at a time. It allows creating different types of websites (landing pages, promo websites, portfolios, business websites, online stores etc.) in quite a short period of time. Your web building experience and skills don’t matter a lot here – the process is simple and intuitive both for newbies and web design pros. Cost: SITE123 has 5 plans. One of them is free. It is used to explore and test the main features of the system prior to upgrading to one of the paid plans. The latter include Basic, Advanced, Professional and Gold plans. They differ in the features, terms and cost and, thus, may be chosen by different categories of web designers based on their expertise and needs. Whatever paid plan you will eventually choose, you will be able to create as many websites with it as you wish. Mind, however, that each of the websites created should be paid separately. Another thing that is worth mentioning here is that the pricing policy of SITE123 depends upon the user’s place of residence. 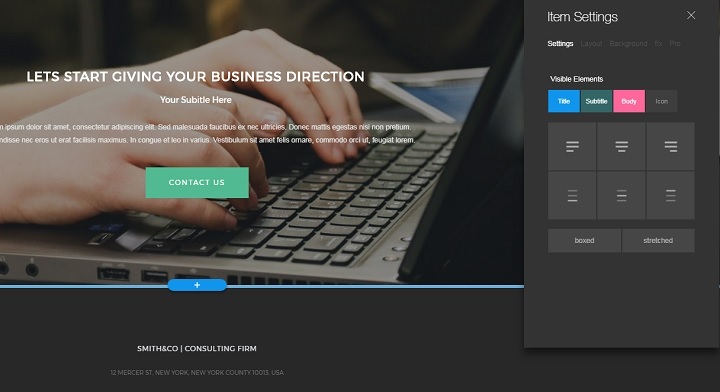 Summary: If you are looking for a universal website builder that will comply with your web building needs and experience, then SITE123 is right what you need. The service is easy-to-use, convenient and affordable. It has everything non-techies and professional web designers need to create stunning websites of any type. The system offers an innovative multilingual tool, which does not only differ it from the rest of the services, but also contributes to the efficacy of the web creation process. The platform is definitely worth the attention of web designers. 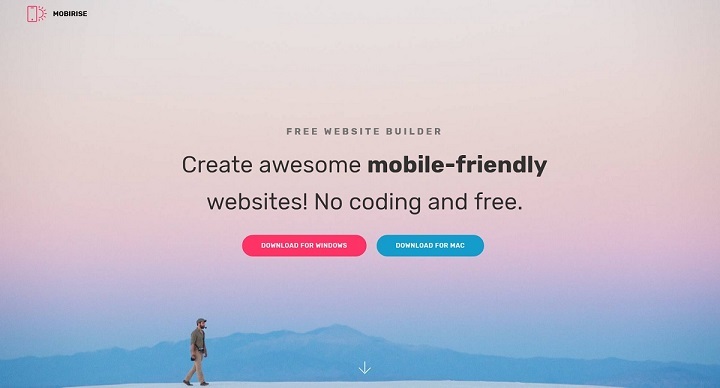 Purpose: If you have already got used to modern web-based website builders, then Mobirise will definitely be a discovery to you. Unlike the majority of contemporary website builders, this system has to be downloaded and installed prior to being used for website building. This feature appeals to many users, who are concerned with security purposes or have Internet connection troubles from time to time. You can create any type of website with Mobirise today, including quality landing pages, business websites, online stores and what not. Cost: Mobirise is completely free for commercial and non-commercial use. You won’t find any plans here. This is a perfect chance for non-techies, who need time to experiment with all the features of the website builder prior to using it on practice. You can spend any amount of time to develop your website. Having done that, you’ll need to buy hosting and domain name the system offers to make your website accessible on the web. Additionally, you can buy extra extensions to get the most out of your website design and functionality. Summary: Mobirise is great for newbies, who are not familiar with all the hardships of the web creation process, as well as for professional web developers, who wish to give their projects stunning design and superior functionality. This offline app doesn’t offer any standard templates most users have already got used to. Instead, it makes it possible to experiment with hundreds of blocks that can be arranged at the website in any order. This is very convenient and simple for everyone. Purpose: Im Creator (XPRS) is a modern cloud website builder, which comes with blogging and eCommerce functionality. The system allows creating different websites, which are responsive by default. Each website created with the platform includes online store solution, which is absolutely free of charge. The system also works great for the needs of creatives, who wish to present their works to the audience in the most effective way. Cost: IM Creator (XPRS) is free for creatives and allows launching quality portfolio websites with no waste of effort, time and money. 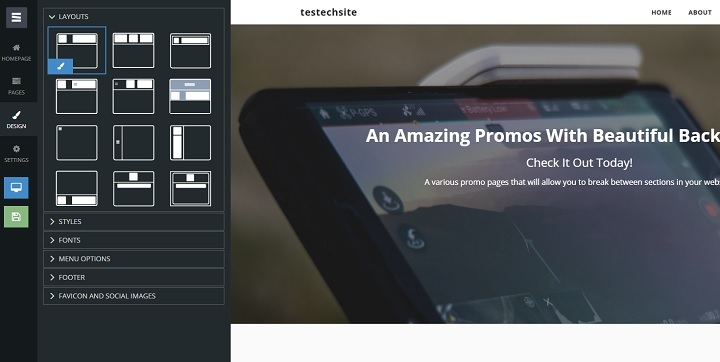 The free plan offers a set of useful features like versatile responsive templates, a choice of thematic sections, no ads included, unlimited hosting, individual domain connection etc. Professional web designers, however, cannot use the free plan to the advantage. They are offered a chance to upgrade to the Premium account that comes with all the features included into the free plan plus premium support. 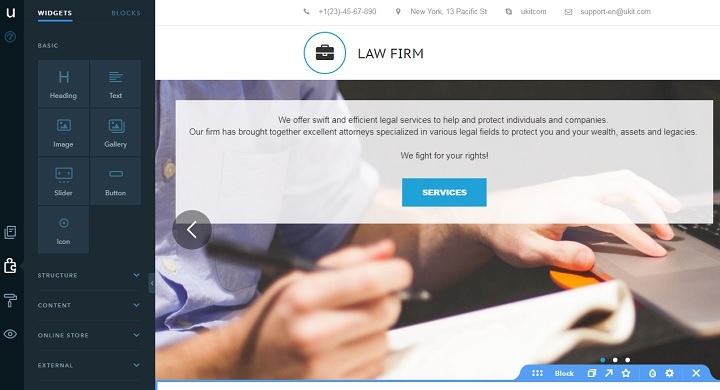 For hosting companies, professional web developers, resellers and white-labels, the system offers its White Label plan that makes it possible to connect any brand that may further be used by the clients. Summary: Im Creator (XPRS) is a drag-and-drop website builder, which perfectly serves the needs of entrepreneurs and people of creative professions. It’s easy to launch websites with the service. The web building process is intuitive and fast, while the result often exceeds initial expectations. This is achieved by the use of responsive templates, functional web customization tools and blocks, which have to be arranged at the website in any required order. The service also offers reliable tech support and affordable plans that come with lots of features users may choose from. Purpose: If you are not a web coding expert, but have your own vision of the web creation process, then Ucraft is what you currently need to get your website running. This cloud website builder meets the needs of newbies and web design pros due to the range of features it offers. The service may be used to launch different website types, such as promo websites, portfolios, landing pages, online stores, blogs etc. Ucraft does not only give you a chance to create an impressive website, but it also allows connecting a custom domain name or a subdomain without any fees. Cost: Ucraft has three plans meant for different categories of users. The free plan is geared towards the needs of starters, who need much time to explore and test all the features of the system. 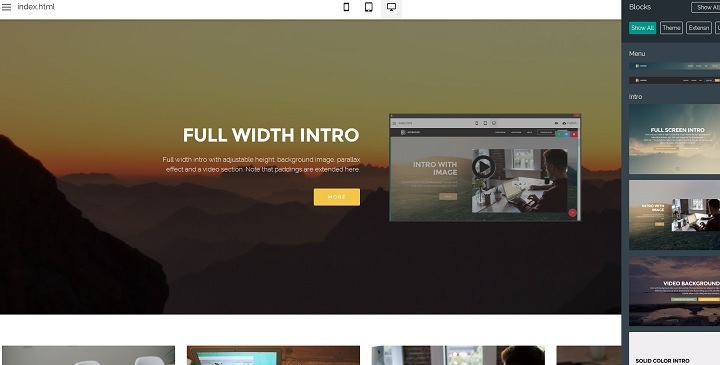 The plan allows building a one-page website with a ready-made template that comes with Ucraft watermark and connects an individual domain name for free. It also offers free hosting and reliable tech support. The free plan, however, will not work for users, who have an idea to create a functional website of their own. If you need to get the one, you’ll have to switch to the Plan for Builders that costs $8/month and unveils more advanced features. Annual subscription to this plan allows you to save up to 20% and connect your individual domain name. If you have already made sure about Ucraft functionality, you may upgrade to the Lifetime Plan the system offers. Having paid $149 once, you’ll be able to use the service for as long as you wish. 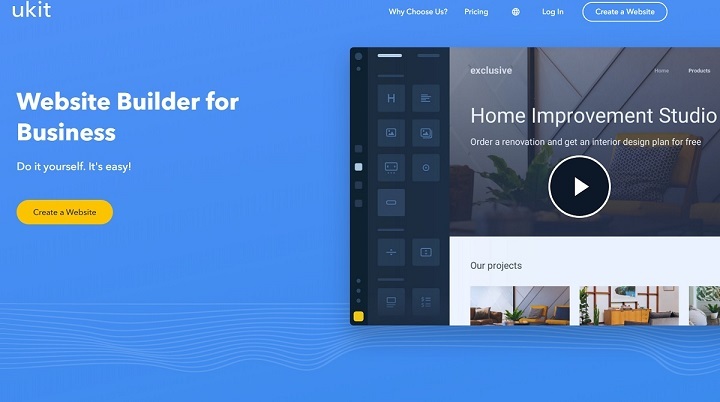 Summary: Ucraft is a nice drag-and-drop website builder, which offers numerous benefits to users, irrespective of their web building experience. 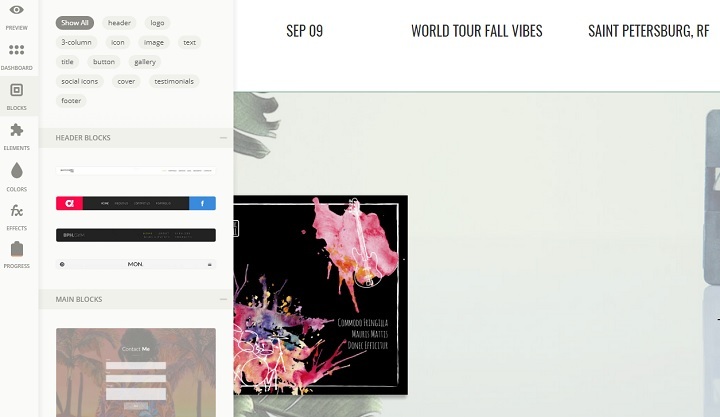 The system has versatile responsive templates, thematic blocks and widgets to choose from. The availability of the multilingual tool allows creating websites with different languages, while powerful SEO features and web design customization tools contribute to their effective promotion and popularity with clients. There is a free plan to test the system and two paid plans, each of which has its benefits. These are the major features that make Ucraft a niche choice for non-techies and web design pros. Purpose: uKit is a small business website builder, the functionality of which is on the top notch level. The service is primarily oriented on the needs of business owners, offering them a wide range of features. The system makes it possible to launch modern, stylish and professional websites without any coding skills at all. Users just need to replace the content that comes with ready-made thematic templates, adding their own info in a couple of steps only. Cost: There is no free plan in uKit, but the system offers a free trial period to test any of the 4 paid plans it has. The trial period extends for 14 days, which is more than enough to try all the features included into the paid plans and to decide on the most suitable option. Paid plans include Premium, Premium+, eCommerce and Pro plans. The cost ranges from $4/month for the cheapest Premium plan and up to $12/month for the advanced Pro plan. The pricing policy is quite reasonable, especially for the entrepreneurs. Summary: uKit is a popular cloud website builder, which works great for building quality small business websites. The website builder is easy-to-use and convenient for everyone, including non-professional web designers. It abounds in responsive niche templates, integrable widgets and features that allow getting the most out of your website design and functionality. uKit pricing policy is also reasonable and won’t hit anyone on the pocket. If you need a professional business website designed in matter of hours, then uKit is the platform you should go for. Many web designers across the globe are looking for effective and easy ways to simplify the web building process. With website builders, it’s easy to achieve this goal today. These services are geared towards the needs of web designers, but they are also oriented on customers, who will eventually use them. Website builders come with all the features and options required to create a functional and attractive website, irrespective of its type and proficiency of a web designer. They are intuitive, convenient and ensure decent result with minimum investment of effort and time.